What are Wet & Dry Rising Mains? 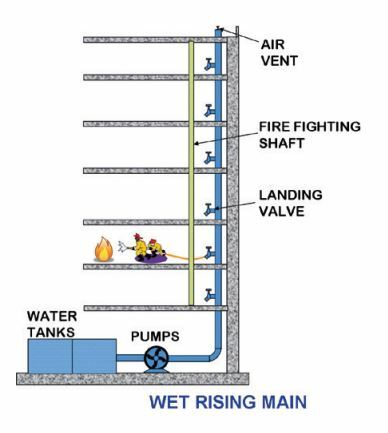 A dry rising main is a system of pipe work and valves, often found in high-rise buildings, which allows fire fighting water to be easily delivered to all floors. 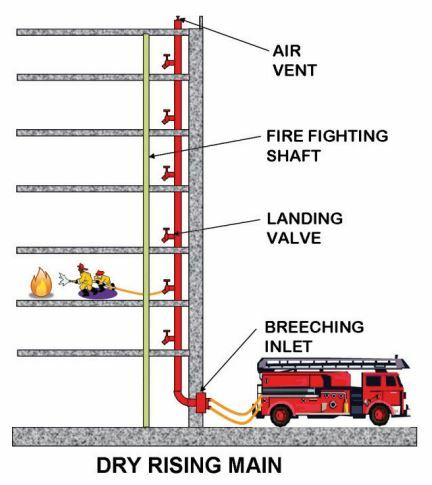 It consists of a vertical pipe with an inlet at ground level on an outside face of the building and outlets (known as landing valves) fitted in cabinets at each floor level, allowing fire and rescue service personnel to pressurise the main from their appliances. Rising mains in buildings can be either filled with water (Wet Riser) or left dry (Dry Riser). The installation of a riser removes the need for firefighters to have to drag charged fire hoses through the building to the upper floors. This would delay fire-fighting operations and create a hazard during evacuation. Wet and Dry Risers should be designed and installed in accordance with BS9990:Code of practice for non-automatic fire-fighting systems in buildings: 2015. Where do wet or dry risers have to be installed? Approved Document B (Fire Safety) of the Building Regulations requires that any building more than 18m high, measured from the fire brigade access level to the top floor. When a building is over 50m then a wet rising main will need to be installed. The pipes in dry risers are empty and are only filled with water by fire fighters on their arrival at the incident. Fire fighters will connect the fire appliance pump to the dry riser inlet via two lengths of 70mm hose. The dry riser is then charged with water from the fire engine, the fire engine water supply is augmented from the nearest fire hydrant. Fire Fighters take fire fighting hose to the floor below the fire and connect this hose to the landing valve, the hose is connected via a 65mm instantaneous coupling and a fire fighting branch connected to the other end of the hose. The landing valve is then opened to allow the water in the dry rising mains to charge the fire fighters hose, enabling the fire to be fought. The fire appliance pump ensures the correct flow and pressure of water is supplied to the floor of the fire. The dry riser inlet is installed at the fire brigade access level. This breeching connection is usually housed in a red glass fronted box with the wording ‘Dry Riser Inlet’. This inlet should be positioned as close as possible to the rising main in order to reduce pressure losses. The inlet box and breeching inlet should be installed with the lower edge of the box between 400mm and 600mm above the ground. The pipes in wet risers are full of water at all times and have pumps that deliver the water to the outlets, these pumps draw water from storage tanks. 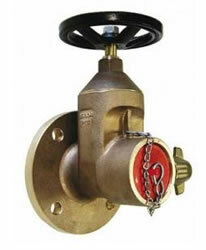 The pumps operate when the pressure in the mains drops when a landing valve is opened. For further information or quotation please contact us.